Did you know that those of us with a high light quotient of our being have aspects of ourselves? Some of them are right here on Earth in 3D. Some of them are in the Galactic Realms, or could be an aspect of one of the Ascended Masters. We may even have an aspect in members of the Galactic Federation, who are actually from all over the Universe. We know for sure that the Magdalenes have many aspects. Since the Magdalenes have been around the longest, we figured out how to split off, or allow another aspect of our being to come onto Earth to get a certain lesson that is needed. Some will bring forth an aspect that was quite brilliant, to bring more light onto the planet. Usually it signifies a level of advanced understanding of evolution, acceleration and previous life preparation. I have personally gotten to know some of my ascended aspects — who are alive and well— so that I could work with them, assist when I can, and share possibilities for the future. A couple of them assist us in our work. We look into the past lives and incidents together as well. The other women from “Team Earth” are able to do the same. If one of our aspects had been very prominent on Earth in a certain continent or country, we assist in reactivating their Light-work for that area. Over the years, we have found and released multitudes of aspects that were captured and kept in hiding in their 5D form. The “dark hats” like to use the energy of our aspects for their nefarious projects, as well as hold them in torture and other perversions, since they know it weakens us. Many people have had an aspect of their soul sung right out of their bodies, and kept by a dark wizard or power-hungry character. This process was quite popular in the Egyptian Mystery Schools, which were all eventually taken over by the dark. Every time one of these aspects is brought back, it gives us more power and strength, since it is a part of us. I can’t even tell you the masses of them that we have found, then healed and recalibrated and brought back to their rightful owner. 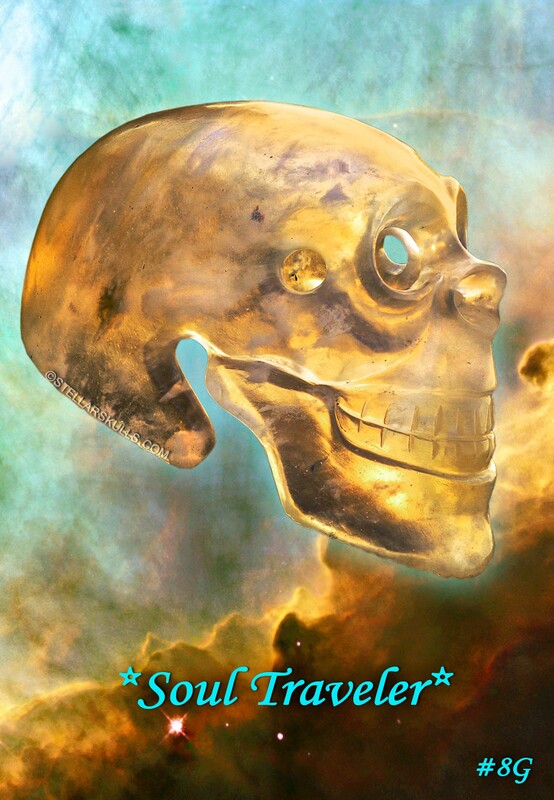 When I first started working with the Stellar Skulls, I had more than a lot of questions for the Galactic Being who was assigned to me then to learn about the Stellar Skulls. I eventually set up a bit of a galactic panel to ask questions of three different powerful Light Beings. I wanted to get a different take on my Crystalline Skull questions. Early one morning, my friend and I settled in for my round of questions, since she was bringing forth the Galactic Team. The Guide of that timeframe was chatting with us, and I once again asked to call forth a particular female entity that I felt very close to. She also really understood the Crystalline Skulls, since she said she had been with them a lot. The Guide started laughing and laughing! “What do you mean? You have got to be kidding!” I said, quite stunned. I must say, it took me quite a while to come to terms with this new, yet old insight. I even asked some of the other Galactic Team members if they were aware of this. “Of course we are!” was their reply — with a big chuckle. A healer friend of one of the gals from “Team Earth” ran into her and shared that she knew she was ethereally tripped up and had recently shattered her shoulder. She felt she had been getting “hit” a lot. This took her over the edge, since it had been one awful thing after the other. She shared that she was ready to leave the planet. One of our gals convinced her to have us look into this and get Clear to the Core with our work. We showed her how to work with the Stellar Skulls, along with her Merkaba and the Blue Ray — which she did — and her shoulder healed in record time — maybe as little as a week! Just recently she had a a curious incident take place. Upon waking up one morning, she noticed a couple of sets of bilateral bruises on each upper arm. She wrote us to ask if we could tell what was going on, since there had been no physical incident that would have created this. She knew we could track these bruises, and she also wanted more help with her very sore foot. We had removed quite a bit etherically from that foot already, but now it was hurting again. It would only heal for a while, and then the intense pain would come back. As I was pondering her bruised arms, it suddenly occurred to me that it was coming from one of her aspects. “Wow! This is strange! How do I tell her this one?” After I shared my findings with one of the gals, we remembered that at the very beginning of our extensive work with her, and knowing she is a Magdalene, the Stellar Skulls told us that she had a Divine Twin. With the in-depth process of scanning and extracting implants and nefarious devices, we forgot about this until just then. At the beginning of our work together, we asked the Skullies and Metatron whether it would be possible for us to remove these devices from her Divine Twin while working on her. I already felt that this Divine Twin was a key to this situation with the bruised arms. We set an appointment with her to explore this, and the sore foot, once again. When we met, I suggested we call forth the Divine Twin’s 5D body and have a conversation with him. A beautiful man from Paris, France showed right up and gave us his name. He shared plenty. He had recently had a bicycle accident that threw him right to the ground. His arms had hit the handlebars hard, and he was still recovering from the accident. His foot was tangled as well, and he shared that his foot had been sore even before the accident. We looked at both his and her feet and ankles, and we saw a big rope tying the two of them together. This was cutting off their circulation, and even though they were tied together, the rope was programmed to keep them apart. This was done by the Dark Hats, or what I call the “Dark Wizards,” since it is dark wizardry. They are the ones that put in all of the nefarious devices and contraptions. We then removed the rope, which gave them both immediate relief. I asked this man if he had recently noticed any changes in his 3D body. He shared that he indeed felt that he was finally waking up to a new level of his spiritual being, and felt he had been in a fog for a very long time. We explained why, and told him about the clearing we had done with our friend, his Divine Twin, and how we had included him in the process. We introduced him to the Crystalline Stellar Skulls, and they shared the splendid results that they were seeing, as being quite profound. He was actually overjoyed and said he wanted to meet our friend in 3D. She had been invited by another woman the year before to go on a River Cruise in France. She told the woman that she would go, and that she also wanted to spend time in Paris. Her friend didn’t want to do that leg of the journey, so our gal backed out of the trip, since it was Paris that was calling her. He had shared how he felt so much better already. We left them pondering who would go where and how they might meet — and in the following days her foot healed. It usually (though not always) takes a few days for the etheric work to move through the physical. We asked the Crystalline Stellar Skulls about Divine Twins, since this was a fairly new concept for us. This is what they shared: “We introduced her to her Divine Twin because they are on a similar soul level, spiritually. They are both at the same place in seeking and integrating their beings, and are very complimentary to one another. Not everyone has or has had a Divine Twin. They have often been Spiritual Masters before in other lives, and they may come together to evolve further. They may do this together in another life, sometimes in the past, and other times in the future. For her it is this one! It is like having a sister or brother Soul Spirit. Or significant other. This is different than a Twin Flame. This reminded me of a channeling event with St. Germain at my house in the mid 1980s. A young gal raised her hand during the questions, and said she would like to find her Twin Flame, and could he assist this process. I could just feel that mighty Sword of Truth being drawn. “I just think I want to be with him,” she replied. “My dear girl, actually you don’t! He has a long way to go to match you, and he is not very advanced. He is not even very nice! I wouldn’t recommend it!” he explained, as that Sword of Truth came wielding down, and a tear rolled down her startled face. A chapter in my recent book, “Crystalline Stellar Skulls ~ Who are They Really?” goes further into the topic of aspects, and how and why to integrate some of them — or possibly even cutting some of the darker ones loose.